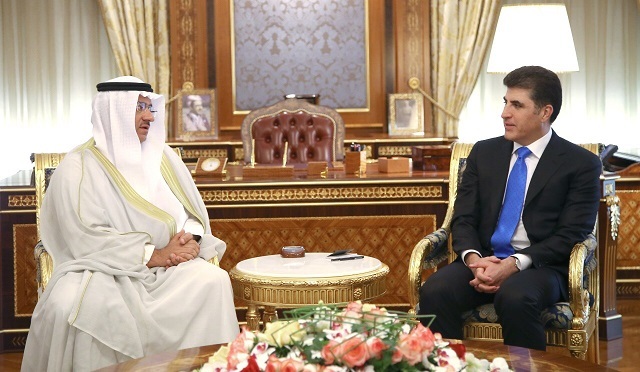 Erbil, Kurdistan Region, Iraq (cabinet.gov.krd) – Prime Minister Nechirvan Barzani met with Mr. Omar Al-Kandari, the Consul General of the State of Kuwait in Erbil. In the meeting, the Kuwaiti envoy reiterated his desire to strengthen bilateral relations between the Kurdistan Region and Kuwait. He briefed the Prime Minister on the humanitarian support provided by the Kuwaiti aid organizations to refugees and internally displaced persons based in the Kurdistan Region, and thanked the Kurdistan Regional Government and aid organizations in the Region for their support. The Consul General also stated that they will encourage Kuwaiti investors to visit Kurdistan and discover investment potentials here. For his part, Prime Minister Barzani thanked Mr. AL-Kandari for his visit and expressed his appreciation to Kuwait for providing humanitarian assistance to the refugees and IDPs in the Region. Mr. Barzani also stressed the need to boost bilateral relations between Erbil and Kuwait, noting that the Kurdistan Regional Government will provide assistance to the Kuwaiti businesses to invest in Kurdistan. The two sides also discussed the planned independence referendum in the Kurdistan Region, future relations between Erbil and Baghdad and other issues.